The following sessions are open to members of Oxford University. History of medicine students and academics are likely to be particularly interested in these courses, given the wealth of relevant images out there, from pictures taken by missionaries to early engravings of the human body. The course examines two major digital image collections subscribed to by the University – ARTstor and Bridgeman Education – geared to research and teaching in the humanities, history of science and medicine, and social sciences. Viewing, presenting and managing images are also covered. Digital images are a valuable part of your research, sometimes critically so. This three hour session will introduce you to some of the key issues that you need to be aware of when sourcing, adapting and using digital images. Although the focus is the use of images in an academic context, the ideas covered are equally relevant to your personal image collections. This entry was posted in Electronic resources, News, Training and tagged images, information skills on 8 November 2012 by . We have just bookmarked the International Mission Photography Archive on the HSMT Oxford Delicious page. 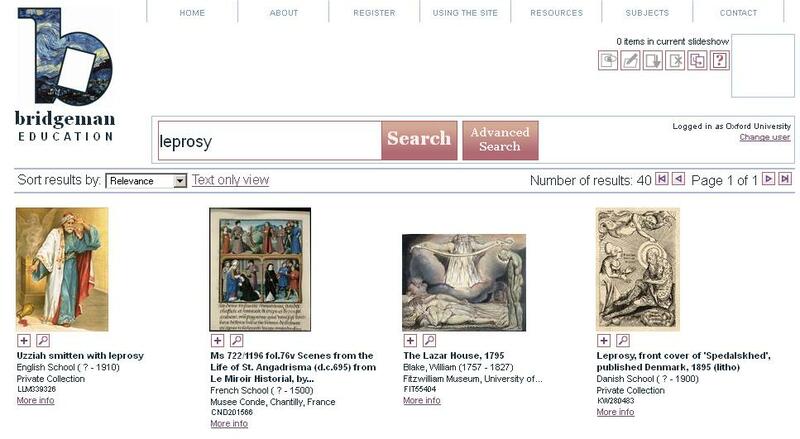 This free online digital image archive offers over 50000 historical images from Protestant and Catholic missionary collections in Britain, Norway, Germany, France, Switzerland, and the United States. The photographs, which range in time from the middle of the nineteenth to the middle of the twentieth century, offer a visual record of missionary activities and experiences in Africa, China, Madagascar, India, Papua-New Guinea, and the Caribbean. The search tools are very effective, allowing you to search by country and/or keyword (e.g. nurse, medicine) and browse by date. The results are presented as thumbnails in the ‘Lightbox view’, but switching to the ‘List view’ provides more details about the results. The detailed results pages are really clearly laid out and provide lots of information. As well as location, date and descriptions, additional subject terms have been added that allow further related searches. The site is very easy to navigate and the information and images are of a high quality. Related links: International Mission Photography Archive | HSMT Oxford Delicious page. 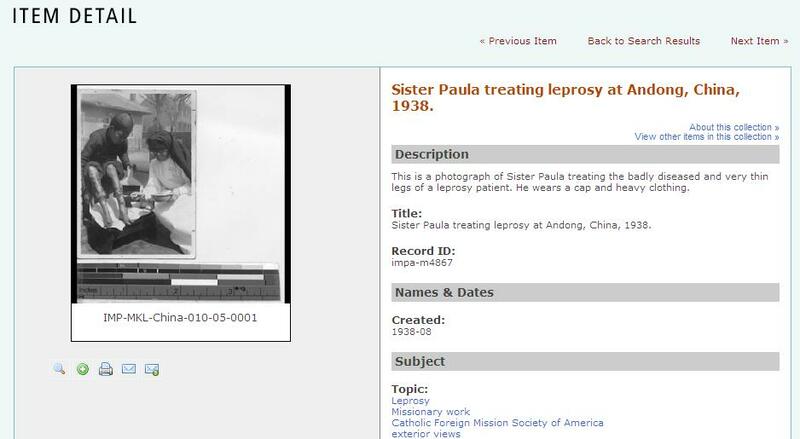 This entry was posted in Collections, Electronic resources, News and tagged digital collections, images, missionaries, tropical medicine on 16 May 2012 by .